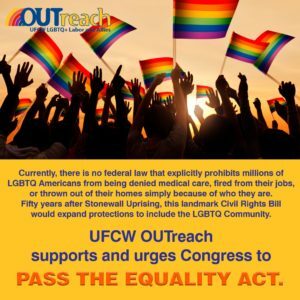 On March 19, the UFCW OUTreach board voted to formally endorse the Equality Act, a new bipartisan bill that would strengthen protections for workers and families across the country and help to end discrimination that has impacted so many communities. Every American deserves the freedom and opportunity to earn a living and build a better life for themselves and their family without facing discrimination. In a majority of states, LGBTQ Americans are still not fully protected from discrimination. While many states have strengthened protections for workers and families who are at risk, the current patchwork of laws leave many vulnerable to discrimination. This bill would ensure that all Americans enjoy the full protection of the law and are not discriminated against when it comes to employment, housing and other public accommodations. In addition to bipartisan support in Congress, the bill has also been endorsed by a broad coalition of more than 160 leading American companies across the country. You can get more information about UFCW OUTreach here.